“We had to help the golf course emerge from the natural terrain we had to work with. I thought it was a very challenging yet spectacular piece of property. Much of it is located on the side of a hill and although there were many opportunities (to place golf holes), we had to find them. Even though we found them, they still required an awful lot of effort to make certain that they work and that they remain stable. 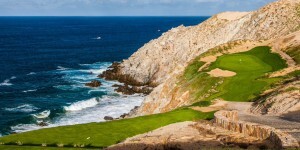 Based on my sixth trip to the tip of Baja, Nicklaus accomplished the “wow” factor he wanted and built a spectacular course with some stunning panoramas, creating some unique holes like Nos. 5, 6 and 13 where the greens are perched on sheer granite cliffs, leaving little margin for error with the ocean waiting for errant shots. 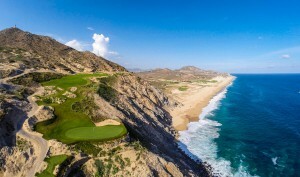 Just when Quivira was getting ready to open in the fall of 2014, Hurricane Odile slammed into Los Cabos, blowing tons of sand onto the newly planted fairways and greens. Pueblo Bonita had up to a 1,000 of its employees raking sand for three days and saved all the grass or otherwise would have had to spend $millions to start over. After playing the first four holes at sea level, players climb from 50 feet above sea level to 285 on a cart path for almost a mile to get to the fifth tee where they see a green 310 yards away, tempting them to try and make the heroic shot to the green. From the blue tees at 288, one of the travel writers I was playing with, made it despite gusts of 10 to 15 mph into his face off the Pacific Ocean. A day earlier, my best effort ended in the water. The safer course is to play down the fairway on the right and still have a “nervous” downhill wedge shot into the narrow green, with only a narrow bunker keeping the ball out of the ocean if you hit it too far. 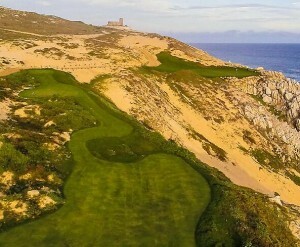 The par 3 sixth, playing from 95 to 180 yards, is carved into the base of a massive dune to the right with the green perched on a cliff high above the ocean and a secluded beach. Playing into the prevailing wind, I took a 4-iron from 165 yards and went straight for the pin, leaving myself a 15-footer for birdie. Two other players got good bounces off the hill to the right and ended up on the green also. The 13th plays to a shelf-like small green that sits atop a massive pinnacle of sculptured granite. It’ shorter, playing 85 to 148 yards, but still requires a do-or-die short iron where anything to the right ends up lost or on the beach below. There is a bail-out area to the left where the ball will bounce toward the green as one of the other guys playing with me discovered. The 12th, the longest hole on the course that can stretch to 635 yards, was the one that gave me the most trouble, mainly because of the blind second shot. I never could get into my mind just where the blind shot needed to be aimed, hitting into the sand dunes on the left both times. I wished that the dunes had been marked as penalty areas where you could have just taken a one-shot penalty and dropped where the ball entered them. The uphill, 90-degree dogleg 14th requires a good drive to reach the end of the fairway to avoid having a blind shot to the green. The same guy who reached the fifth green cut across the sand dune to the right and again ended up on the green. My wedge flew too far and he and I were both on the upper level of the green—a place you do not want to be. To avoid putting the ball off the green, I just putted to the left to have a second putt from 15 feet. He aimed to the right and just got the ball to the crest and it ended up left of mine. Director of Golf Antonio Reynate told me at dinner the first night that work would be done to take out some of that slope to make it more playable and give them more available pin placements. The fairway on the par 5 15th is the highest point on the course at 380 feet above sea level and then you get a downhill par 4 before finishing up with a pair of long par 4s where even after good drives that I couldn’t get home with my longest hybrid in the rental set of TaylorMade clubs from the blue tees at 440 and 401. A 5-wood might have turned the trick for me. The green on the 18th sits right next to the beach and features a deep trough at the back that can make putting or chipping from the front more difficult. The course is unique in another way with three par 3s on the front and one par 5 for a par of 34 while the back 9 plays to par of 38 with three par 5s and one par 3. It can be stretched to 7,139 from the black tees, which only a few play regularly. The gold tees play at 6,701, the blue tees at 6,216, the white tees at 5,458 and the red tees at 4,763. For first timers, I’d suggest playing the blues on the front and the whites on the back at 5,702. It does take five hours to play the course because of the distance between tees, the stops at the four comfort stations for drinks and food and, of course, sometimes to just take in the views or take photos. The course is for exclusive use by owners and guests of Quivira Lost Cabos, a luxury resort and residential community, but also as an amenity for guests of Pueblo Bonito Golf & Spa Resorts, who get discounts off the $300+ green fees.